Alright, let's start with a nice Black-necked Stilt. Lovely bird, and a common summer resident. There's a Lesser (I think) Yellowlegs next to it, good bird, pretty regular migrant. In the middle there is a Red Knot, which is, you know, not the most common bird, but I guess shows up in spring. Then, oh. Uh that next bird is a Piping Plover, which, hmm, well it doesn't have any eBird records for Antelope Island. Hmm must be an oversight. No matter, let's keep looking. Ha oh. American Oystercatcher. There are no American Oystercatcher records in eBird for Utah. THIS IS ALL TO SAY THAT THIS MUG DOES NOT SEEM TAILORED AT ALL TO ANTELOPE ISLAND STATE PARK IN UTAH! Yes, believe it or not, the fact is that our nation's small parks and birding clubs are not commissioning original bird artwork to slap onto mugs. I figured that there may be other examples of this image showing up in places where the birds aren't. I put the call out on America's favorite micro-blog, and got a few good responses. Rick Wright says he's got a shirt from Tucson, Arizona with this image on it. Like, none of these birds are found in Tucson. Sam Jolly of the Birder's Conundrum crew has a magnet from Pea Island NWR, in North Carolina. This is a perfectly fine image for the east coast. Desiree Narango has the same mug from Bombay Hook, DE, which is also fine. The Audubon Society of Portland has the mug on sale. That's Portland, Oregon, not Portland, Maine, and therefore just totally totally wrong. Amazon sells an apparently blank version. Here's a larger, flipped version on a t-shirt. The copyright mark on the mug credits Atlas Screen Printing. Lo and behold, the image is available here on their site, ready for transfer to all matter of gift-shop-ready goods. You can even get the birds embroidered on this not cool hat! That Atlas page is actually a pretty good resource if you're looking for ornithologically-accurate bird images to slap on your stuff. I encourage the continued patronization of Atlas, but, please, before you buy make sure the birds in the image might actually be seen nearby. 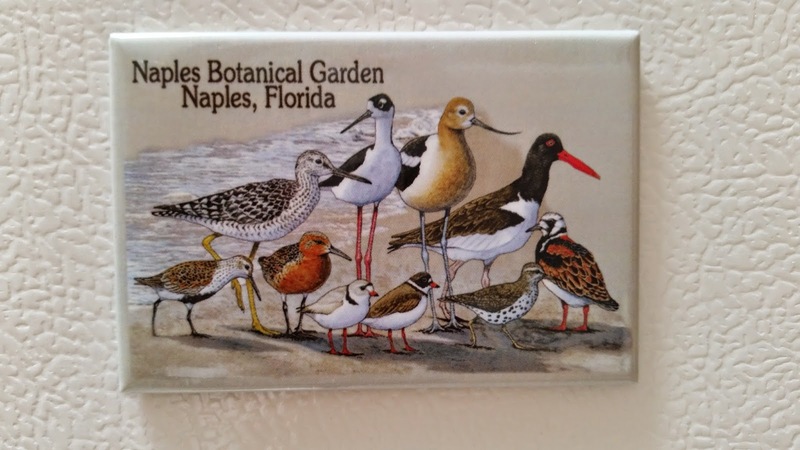 Reader Sue has sent a photo of this shorebird image on a magnet from the Naples Botanical Gardens in Naples, FL. Makes sense. The first thing I think of when I think "botanical gardens" is shorebirds. Another one! 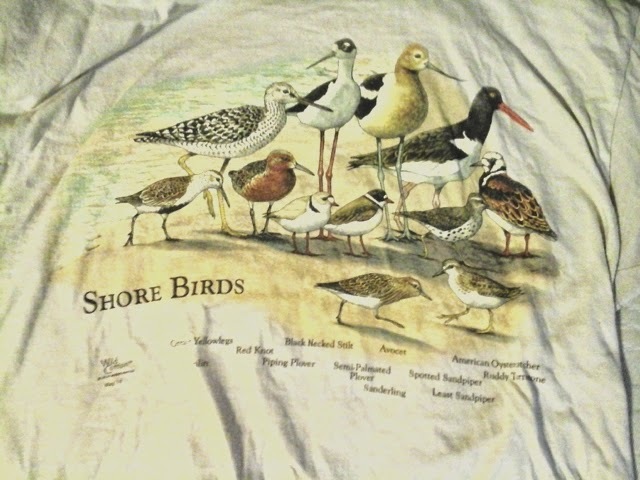 Martina of the Field Sparrow Field Notes blog has sent in a photo of her Shorebird t-shirt. No geographic errors on this one, but she does point out the misspellings of "Semi-Palmated Sandpiper" and "Black Necked Stilt." Also, no "American" before "avocet." Thanks, Martina! I have a magnet from the Naples Botanical Garden in Naples, Florida with the same image. Love your blog! I too, just got that shirt with the same exact design with it. I got it from Brookgreen Gardens in coastal SC, but I've seen it a Merritt Island NWR too. Thanks Sue and Martina! If you have photos of your shorebird thingies, feel free to tweet them @thebirdist or email them to thebirdist@gmail.com and I'll post them! Although I can't recall specific places at the moment, I have seen interpretive signs at bird preserves and wildlife refuges that show birds that are completely out of range or would be considered vagrants for that paticular area. I have the same shorebird picture on my Georgia Ornitholigal Society mug with their logo on it too, so this is likely in lots of birding clubs.